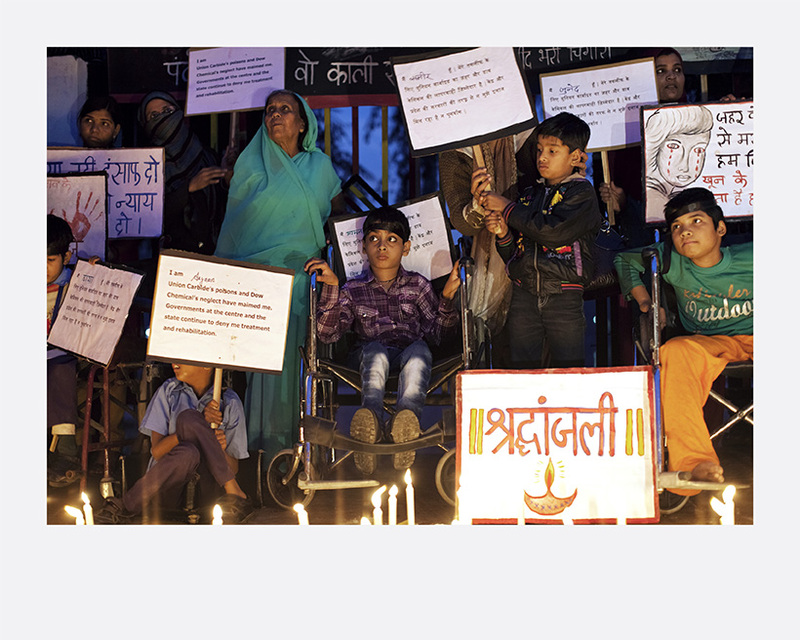 In 1984 the poison gas leak in Bhopal, India, claimed 8000 lives and injured countless more. Thirty years later there are still a hundred thousand people chronically ill from the effects of the gas cloud that escaped from the Union Carbide factory. The remaining poison keeps polluting the drinking water and has caused a sharp rise in the number of children with birth defects. The law suit against DOW Chemical (the company that bought Union Carbide) is still dragging on after thirty years. Abandoned by their own government, the population have no other choice than take things into their own hands. They established the Chingari Trust Rehabilitation Centre, which has seen to it that the local authorities regularly provide the most polluted neighbourhoods of the city with clean drinking water. Alex Masi (b. 1981, Italy) believes that documentary photography is essential for showing the injustices people commit against others, and in particularly children. With his series Bhopal Second Disaster, Masi won a prize from the de Photocrati Fund. His work has appeared in National Geographic, The Guardian and El País Semanal, among other venues. Bhopal Second Disaster was produced with the invaluable support of the ‘2011 Getty Grant for Good’, the ‘Focus For Humanity Fellowship’ and ‘The Photocrati Fund 2013’.